If Walter Gropius could see the new Vizio CT14-A2 Ultrabook, he’d probably approve. It sports a sleek, metallic elegance, like many of the quintessential Bauhaus designs. And as the Bauhaus school would do, Vizio stripped out seemingly essential features, but the end result is a compact, lightweight, usable laptop that performs well and looks good. It also sells for a very reasonable $1199. At first blush, the CT14-A2 seems mostly distinguished by its lack of features. Just two USB 3.0 ports are included, one on each side. A lone HDMI port is on the right side, providing the only video output port. The system lacks a wired ethernet jack, and doesn’t include a USB-to-ethernet adapter, as similarly thin Asus Zenbook UX31E. Perhaps the one absent feature that people might really miss, though, is a flash card reader. As with the Macbook Air, the CT14 and its larger sibling, the CT15, is built using aluminum unibody construction. However, a black bezel surrounds the display, which tends to bring your eye to the LCD panel rather than to the surrounding bezel. The keyboard is equally striking in appearance. The keys are big, every so slightly sculpted and beveled. The large touchpad is one in a new, unified style with no visible buttons, and supports multitouch gestures. Looking good is one thing, but does the CT14-A2 deliver on performance? This particular CT14 is the A2 model, which ships with a Core i7-3517U processor. The dual-core 3517U includes 4MB of L3 cache, supports hyperthreading (so it can handle four simultaneous threads), and ships with a base clock of 1.9GHz and a maximum turbo speed of 3GHz. As with many similar Ultrabooks, it has 4GB of DDR3 memory, some of which must be used as the frame buffer for the integrated Intel HD 4000 GPU. 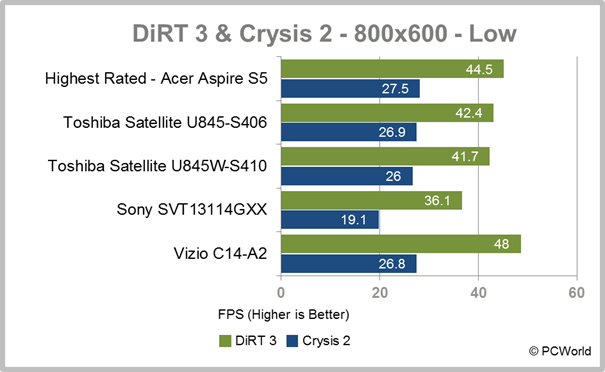 Performance is close to a dead heat with the highly rated, but pricier, Acer Aspire S5. 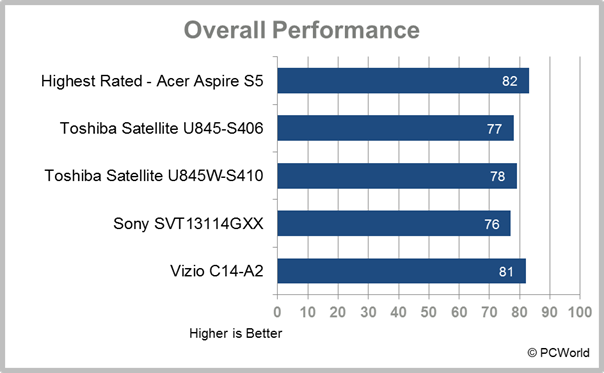 The Vizio has an overall performance score of 81 on PCWorld’s demanding suite of tests, versus an 82 for the S5. A thin-and-light system like this is often used for office applications and on-the-go Web duty. 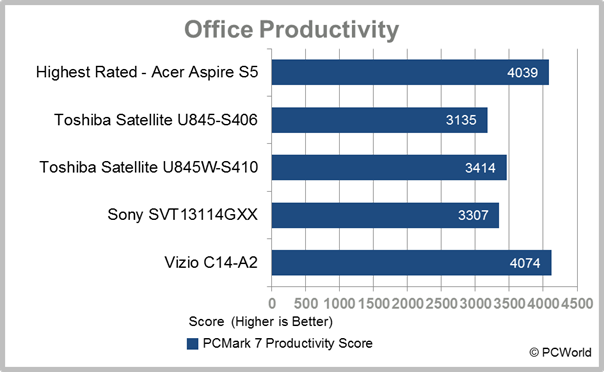 To that end, the Vizio posted very good scores in the PCMark 7 office productivity tests compared with other systems in its class, eking out a slight win over the Acer Aspire S5. On the other hand, it looks like the Vizio’s solid-state drive is a bit slower than the Acer's, but it’s still an SSD, so it's speedier than Ultrabooks that use traditional hard drives. As you might expect, gaming is not the CT14’s strong suit. Intel’s HD 4000 integrated graphics is improved over past Intel efforts, but that still translates to subpar scores in most demanding 3D titles. We saw playable frame rates at only the lowest detail levels, and at 800-by-600-pixel resolution. In the end, the CT14-A2 maintains parity with the more expensive Aspire. While it costs more than equivalent Core i5-equipped Ultrabooks like the Toshiba Satellite U845-S406, the Core i7 CPU combined with the 256GB SSD makes for a speedy user experience. 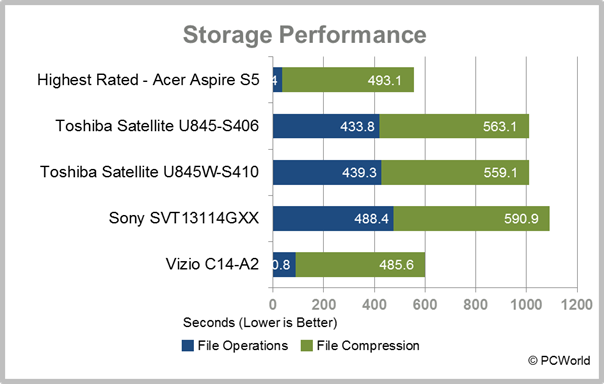 Note that lower-cost models of the CT14 are available with smaller SSDs and lower speed processors. 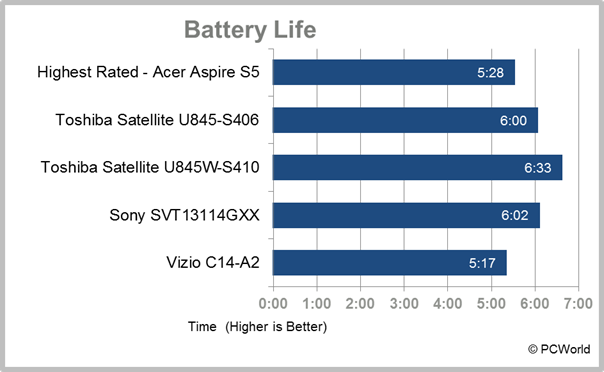 As with many extremely thin and light systems, tested battery life is less robust, at 5 hours, 17 minutes. While this is close to the Acer’s 5 hours, 28 minutes, it’s below the average of 6-plus hours for other Ultrabooks. Having only two USB 3.0 ports, no physical ethernet connection, and just one output port puts the CT14 squarely in Macbook Air territory. Apple at least includes a flash memory card reader for the Air, something the CT14 lacks. However, the CT14 is Bluetooth capable, so you can use a Bluetooth keyboard and mouse if you want external input capability without consuming a USB port. Dual-band 802.11n support is included, a welcome addition. If a system is going to rely only on Wi-Fi connectivity, dual-band is a must for best throughput. The lone HDMI-output port supports HDMI 1.4a, so it can handle even high-bandwidth devices. A dual-purpose headphone/microphone port is built into the left side. The headphone amp tends to distort a bit at high volumes, even with very good headphones. The built-in speakers are the weak point, sounding a little thin and inaccurate. Vizio includes SRS Premium Sound, but the equalizer settings seem a little off. In a switch from my normal preferences, I liked the sound from the built-in speakers better with SRS off, though audio through my Sennheiser HD 580 headphones sounded better with SRS enabled. Video quality is something of a mixed bag. While color rendition appeared fairly accurate, the overall impression seemed slightly muted in tone. The display can be dialed up to eye-gouging brightness, should you need it. I saw visible shifting of color and contrast when viewing off-axis to one side, though the shifts were not too bad. Vertical viewing angles vary—looking from the top down results in severe image degradation, but bottom-up viewing is less washed out. Normal office use and photographic editing worked well, and the 1600 by 900 pixel screen and its 14-inch (diagonal) size were welcome. I took a little time to adapt to the keyboard. The depth of the key presses are very shallow, something I generally don’t like, but the overall tactile feedback and sheer phyicsal size of the keys substantially made up for the shallow keystrokes. There is no visible PgDn / PgUp cluster, but the Fn + arrow keys handled this feature, as is the case with many ultraportables. The F1 key default state is to take you to Vizio’s support site. When I launched it, I was immediately notified that an update for the touchpad driver was available. That driver update improved touchpad usability a bit, enabling stronger palm detection and fewer wild cursor swings. Overall, typing and pointing were positive experiences, but a little more texture to the keys would have been welcome. The touchpad also supports edge detection, making it ready for Windows 8. Sliding your finger off the edge will bring up the charms bar in the Windows 8 interface. The CT14 sports a 14-inch screen, and is exceptionally light for that class of display. The Vizio weighs a scant 3 pounds, 7 ounces without the power brick. With the PSU, it weighs in at 4 pounds, 4 ounces. That’s substantially lighter than a number of Ultrabooks with smaller screens. The power connector is an oblong shape, which connects at right angles to the system and lights up when charging. The Vizio is also exceptionally quiet. A vent is built behind the hinge, so warm air exhausts straight out the back, not onto your lap. I fired up Google Chrome with over 20 Flash-heavy tabs running, and the fan didn’t kick in. When the machine was running PCMark 7, the fan finally fired up, but overall noise levels were pretty low—far more muted than the Sandy Bridge-equipped Macbook Air I often use. Overall, the Vizio CT14-A2 is a distinct pleasure to use, but it’s not perfect. I would still like to see a built-in memory card reader. The lack of an ethernet jack isn’t a deal breaker, and we’re likely to see more of these compact systems that eschew wired connections. The keyboard and touchpad are quite usable, though there’s still some room for improvement in pointing behavior. The display is good, not fabulous, but its size and resolution are welcome. Perhaps most disappointing is the overall sound quality of the speakers, given Vizio’s background as a consumer electronics provider. Still, the whole is definitely greater than the sum of the parts. Vizio’s first entry into the PC business makes a bold design statement, getting many things right, and the misses are near-misses, rather than thuds of disappointment. The whole affair feels solid, looks good, types well, and performs like a champ. What more could you want in a PC? Vizio ships a sleek, gorgeous looking laptop that performs well, with an emphasis on usability over features.